Al Salam palace is located on the site of the former Republican Guard Headquarters, which was destroyed in Desert Storm. Construction had been ongoing since then. Part of a 814,000 square meter complex outside Baghdad, and begun while sanctions were in effect, construction of the Al Salam Palace was completed in September 1999, at a cost of about $1 billion. The Al-Salam Palace was used to house visiting foreign dignitaries. The United States attacked the palace by air in 2003, hitting it with seven guided bombs. Looters struck next, making off with everything including the toilets. As of late September 2003 there were between 2,500 and 3,000 people on the whole Al Salam Palace grounds (the Palace and maybe 10 surrounding acres), of which there are 1,000 civilians and 1,500-2,000 military. These consist of about 75% American, 15% British, and a smattering of Australians, Spanish, Italians, Poles, Romanians, and even a Ukrainian or two. There are giant trailer parks surrounding the Al Salam Palace, and some unfortunate people live on cots in the north wing, and the really unfortunate ones in 500-to-a-tent tents full of bunk beds on the front lawn. This section is known as Camp Arkansas, because it is hundreds of trailers on an ugly expanse of dirt...! In mid-September 2004, as part of an Army-wide effort to give its facilities around Baghdad friendlier connotations, and to try to resolve the issue of constantly-changing facility names, Camp Highlander was renamed Camp Prosperity, with its Arabic translation "Camp Al-Isdehar". As of April 2004 the 1-161st Infantry Battalion was posted to LSA Highlander, adjacent to the International Zone (formerly known as the Green Zone), in Baghdad. They were attached to the 3rd Brigade Combat Team of the 1st Cavalry Division and were conducting combat operations and civil-military operations in SE Baghdad. Logistical Support Area Highlander was at the Al Salam Palace. Some sources claim that Logistical Support Area Gunner is also known as LSA Highlander, but this is evidently incorrect, as LSA Gunner is at Taji AB, some distance north of town. It is believed that LSA Highlander was also referred to as Camp Highlander. For those who love fishing, Baghdad has an impressive number of fishing holes, something you might not expect when you think of the desert and sand of the Middle East. The only thing missing in those lakes, when you're the founder of the Bass Anglers Sportsman Society (BASS), are the bass. The "Bass Boss," Ray Scott, brought his "Iraq Thanksgiving Tour 2004" to Camp Prosperity, where the lakes actually have names, like Fish Lake and Deer Lake. Camp Prosperity is home to the 1st Battalion, 161st Infantry Regiment, from Washington state's 81st Infantry Brigade, attached to the 3rd Brigade Combat Team, 1st Cavalry Division. 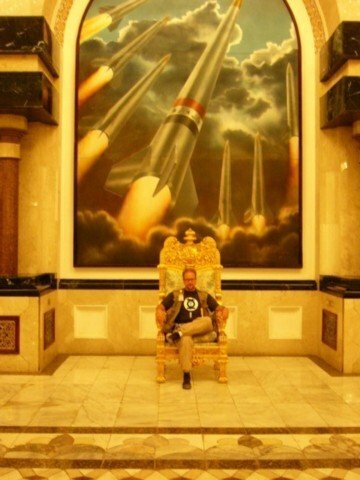 In December 2004 Saddam Hussein's former palace at Camp Prosperity was the home of Companies C and D, 3rd Battalion, 325th Airborne Infantry Regiment, 82nd Airborne Division. Paratroopers from the 82nd Airborne began deploying to Iraq on Dec. 3, 2004. The unit is stationed in Baghdad's International Zone. Because of the nature of the battalion's mission, each of its companies is based in a different section of central Baghdad. These sites will be the paratroopers' new homes until the end of the deployment. The palace where Delta and Charlie Companies were based is in the area of the International Zone known as Camp Prosperity. That name seems appropriate. The road to the palace bisects a shimmering man-made lake lined with green palm trees. The columned entrance resembles some ancient Greek temple. Inside the palace, however, it's a different story. The hallways and rooms are a maze of plywood boards dividing the paratroopers' living quarters. Cots, ruck sacks and all the other equipment of an Army at war are stacked against the walls. In the building where Saddam Hussein once slept on silk sheets, paratroopers wrapped in their sleeping bags watch DVDs and play card games on the floor. A few hundred meters away, an immense statue of Saddam's head sits in the dust, surrounded by concertina wire. It, and three others like it, were removed from a building when Saddam's regime was defeated. Now the statue lies in the dirt, its eyes gazing off into the distance. Occasionally, a paratrooper will stroll over, snap a picture, and then head back inside to relax in what was once the dictator's palace.